DentalTechTips is very excited today to have the opportunity to interview with distinguished technician: Spiros Chatzigeorgiou, CDT. 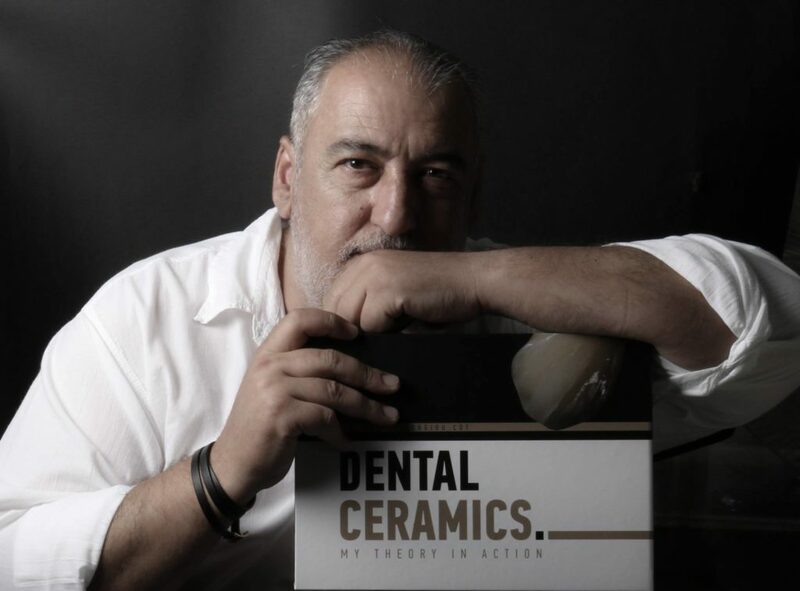 Spiros recently published his book, Dental Ceramics: My Theory In Action. It is a book that includes basic knowledge of the properties of light, everything you must know about colour, the Matrix4all technique, demo and Matrix cases and clinical cases that were inspiration for this book. Thank you so much for agreeing to interview with me. Your book has been making great impressions with some very big names in the dental lab industry worldwide. Congratulations, and even though I haven’t read it personally yet, it really shows that you’ve put your life’s passion and knowledge into the pages. I hope to get a chance to read it soon. To start, let’s have you tell me a little about yourself and your career as a dental technician, Spiros. I have been a dental technician for more than 34 years and for the last 28 I’ve been running my own laboratory. In the beginning I started studying without knowing anything about the profession. My favorite hobbies were painting and sculpture. So, you understand that it came as a pleasant surprise to realize that our profession was so closely related to what I already loved. How would you describe your book “Dental Ceramics: My Theory in Action” to someone who has not read any dental technology book? Someone who hasn’t read anything like that before, huh? OK, but I’m sure he’s taken part at some seminar, right? So your question helps me to talk exactly about the meaning and the value of this book. When somebody reads my book, it feels like participating in several of my books because they can read the theory and my philosophy about light properties that is maybe the most important thing for anyone using ceramic materials. Also they can see new layering techniques and demo cases created step by step with images. How did your inspiration for writing this book begin? Was it a certain restorative case, or a particular event that motivated you? Actually, I’m not really sure how it all started. I had a lot of demo cases and clinical cases with full documentation that I had been using in my seminars. Once I had an idea to include a few of those in a user’s manual, and after that I got the main idea. “Knowledge is the movement from darkness to light.” Could you expand on this phrase a bit further? How does it apply to dental ceramics? What can make us stand out in our professions, regardless of what we actually do, is knowledge; knowledge can boost our self-confidence, our status, our self-trust and helps us feel less stressed. So when I saw this phrase from the great American philosopher Alan Bloom what surprised me is that within 8 words he conveys the whole meaning. Now, how does this apply to dental ceramics? Forgive me for the answer, but I believe that the art we put on dental ceramics is the Mother of all arts. How long did it take you from start to finish to complete this book? Well, it took me about 18 months, altogether… a year and a half. Documenting a single case from start to finish is a time-intensive and labor-intensive task. Could you run us through what type of equipment and what mindset you had while going through and documenting an average case for your book? OK, let me give you an example. I have a fantastic case on my desk right now for lower teeth with roots and gums on implants. This is not a very common case. I’m trying to find time because this needs three times more time that usual as I would like it to have it step by step in my library. I’ll now tell you something most people don’t know. If someone works that way, they gain great knowledge and experience themselves. What excites you most about the dental lab industry? The answer to that question is, of course, ceramic materials and what excites me above all is challenging cases, discolorations, demanding works and all this adrenalin sensation which is created until I reach my goal. I obviously mean the try-ins and corrections with the patient present. In my protocol of custom cases I always start with color selection and photo-shooting. Even in those cases, in the try ins there’s always anxiety and things do not always turn out as well as we want them to so I need to have immediate solutions. All this game excites me so much! You have been in the industry for a long time and are a well-respected lecturer, specifically your hands-on courses with Heraceram 750. What is it about Heraceram that makes it your product of choice over other porcelain systems? Usually in my lectures, I try to talk about light properties such as fluorescence, opalescence, iridescence and phenomena like reflection, absorption, diffusion, scattering as well as, of course, explain their interaction on human teeth and ceramic restorations. This is the basic theory that every single ceramist should now about. All this has nothing to do with Heraceram, Ivoclar, Noritake, GC etc. but it has to do with the management of the material to get the light properties. Today, almost all companies create very good stuff. I’ve been working with Heraceram for the last six years. If I have to give a quick answer why, it is because Heraceram materials have the translucency that I need and which makes the result of my restorations look natural. The second reason which is also important for me when I work with companies is to trust both the material and the company. What do you hope that your book release will do to affect the dental lab industry as a whole? I’m not sure I can answer this question. What I believe about my book is that it is useful for somebody only as a tool…a tool of knowledge. I know very well that in every lecture on hands-on each participant perceives a few things depending on his level. I’ll try to make this clear: if the same technician is part of the same lecture several times, he will perceive different things each time, which means that he is developing. So, my book is like somebody being part of several lectures and every time discovering new things. The other part of this book is inspiration. This book includes clinical cases and a step by step approach to them. Most of my techniques are easy so anybody can work with those and see the results. What is your vision for the future of the dental lab industry? Oh… what I see is not hopeful. Please, allow me not to say any more. You demonstrate some very advanced techniques and high aesthetics in your book. This may be a bit discouraging for someone who is just starting out. What would your advice be to a new ceramist who is hoping to improve their skills? No, I disagree that I demonstrate advanced techniques. Now… let me find an easy way to answer. Let’s say every tooth, in order to be part of nature, needs ten details. The first one is brightness. This means that somebody can recognize the mistake from 15m away. The second detail is the form. It means that somebody can recognize the mistake from 7m away. The third one is the hue… 3m etc. etc. What I’m suggesting for somebody who’s just starting is start with those three and every period of his career add more details for his development. What I can say is that after the first six, the rest is not easily discernible from the human eye or it needs very special light sources. Do you have any plans to write more books in the future? If I have to say things, I’ll do it. I’m an active dental technician and every day I see different patients, different cases and I need to add new techniques or more skills. If this experience I feel can be taught, I’ll definitely do it because I firmly believe that knowledge that is not transmitted dies. Spiros’ Book is available for purchase now. Check out his website: https://www.dentalelab.gr/ to order it! Thanks for reading and stick with DentalTechTips for more great interviews! !